As an African American growing up in the 1950s in Canton, Ohio, Alan Page thought his opportunities were limited. Most of his peers, like so many before them, would have little choice but to work in the steel mill: work that was physically demanding, dirty, and tedious. He wanted to have more of an impact. And in a country in which it is extremely difficult for someone to achieve top honors and impact in any given career, Page did it in two: professional football and law. Page, B.A. ’67, is a former Notre Dame All-America football player and NFL Hall of Fame member. And after that success, he became the first African American justice of the Minnesota Supreme Court — a position he held until he retired at the mandatory age of 70. 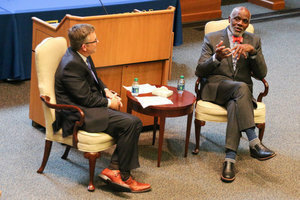 Page spoke to Notre Dame students recently in a conversation with Mark P. McKenna, associate dean for faculty development and professor of law, in the Patrick F. McCartan Courtroom. McKenna himself was a walk-on football player at Notre Dame when he was an undergraduate. Page visited as the Judge James J. Clynes, Jr. Visiting Chair and was also presented with the Moose Krause Distinguished Service Award during the Monogram Club’s 100th Anniversary Celebration. Page told law students that he hadn’t planned to start his career as football player. He wanted to be a lawyer from a young age. What he saw changing in the 1950s was changing because of lawyers — and he said it gave him hope. “When I was eight years old in 1954, the United States Supreme Court decided Brown v. Board of Education,” he said. “That had a tremendous impact on me. I remember reading newspaper articles in the Canton Repository and Cleveland Plain Dealer about the decision. It inspired me. The 1950s and ‘60s were a period of significant change in the United States. The Civil Rights Movement exposed deep-rooted divisions in American society. Social and racial tension and turmoil were at the forefront of American life. Page said that he wanted to be a part of the solution. Page’s path to becoming a lawyer was not a straight shot. Football called. Page first started playing the sport in his freshman year of high school and by his senior year, he was a star. As a defensive tackle, Page was a consensus All-American and was drafted by the Minnesota Vikings in the first round of the 1967 NFL Draft. He quickly excelled in the league and earned Pro Bowl honors following his second season in 1968. A fierce pass rusher, Page led the Vikings’ “Purple People Eater” defense to four Super Bowl appearances. After 11 years with the Vikings and a three-year stint with the Chicago Bears, Page retired after the 1981 season. During his career, he was named to six All-NFL teams, nine straight Pro Bowls, and was the NFL’s MVP in 1971. In addition to being a success on the field, Page began laying the groundwork for a second career during his second season as a professional athlete. Page enrolled at the William Mitchell College of Law in 1968 and took night courses while playing professional football. It did not go as well as he had hoped. What he didn’t know at the time, he said, was that most 1Ls feel that way. He dropped out of the program after a few weeks and went back to focusing on football. He tried his hand at a couple of business ventures, including investing in a vending-machine company and trying his hand as a used-car salesman. Business, he said, was clearly not for him. In 1975, Page decided to go back to law school and enrolled at the University of Minnesota while still playing for the Vikings. The second time around, Page said he was successful because he gave up the notion he needed to figure everything out on his own. Page graduated from law school in 1978 and worked for the law firm Lindquist & Vennum before working in the Minnesota Attorney General’s Office. Page described several attempts to seek election to the Minnesota Supreme Court. In 1990 he filed for election to a seat that would be vacated by a justice who would soon be reaching the state’s mandatory retirement age. Page said his decision to run for the seat was unusual because, in previous cases in which a justice retired before the end of his or her term, the governor had appointed a replacement who then, pursuant to Minnesota law, stood for election at the first general election one year after his or her replacement. “It seemed to me that it was a fair question to ask the people of Minnesota to decide whether they wanted essentially an unknown justice who was appointed after a vacancy, or at least a known quantity in me,” he said. But that attempt to reach the Supreme Court was stymied when the justice facing mandatory retirement resigned from the seat, creating a vacancy that was immediately filled by appointment, and the election was removed from the ballot. Page decided to run again in 1992 to replace another justice scheduled to retire. However, the governor extended that justice’s term, again blocking Page’s chance at an election. Page challenged the extension (Page v. Carlson, 488 NW 2d 274 (1992)) and a special court ultimately ruled in his favor. He ran for the open seat on the Minnesota Supreme Court and became the first African American to serve there. He was reelected in 1998 (with the largest vote in Minnesota history), again in 2004, and for a final time in 2010. Page spent much of his legal career examining and fighting racial bias in the justice system and working to give students of color access to post-secondary education through the Page Education Foundation he founded with his wife Diane. Notre Dame students asked Page how he would suggest dealing with current challenges in society, including tensions between the black community and police. Page said lawyers should help opposing sides better communicate to reach solutions — and to start by listening more to understand the different perspectives. “It’s a tremendous opportunity for lawyers to be actively involved in this mess that seems to be spiraling around us,” Page said. “We’re good at yelling at each other and talking past each other. It’s just not enough to march and protest and say we want change. Lawyers, including potential ones such as Notre Dame Law students, also have a responsibility. “You are among the privileged people in this country,” Page said. “All of you have worked hard but you didn’t get here on your own. Someone helped you along the way. As you go through life, never forget that. Originally published by Lauren Love at law.nd.edu on November 14, 2016.